You’re a small consumer goods company in a tight margin industry. So you watch every penny of operational expense, including LTL shipping costs. You’d love to shift a portion of your LTL freight over to faster, cheaper, more reliable truckload service, but that’s not in the cards since you don’t have the volume to fill a trailer. Right? Working with the right 3PL, you can combine your freight with freight from that 3PL’s other customers to build full, multi-vendor truckloads. The critical enabler is that your load consolidation 3PL has a dense concentration of customers who ship like products to the same retailers. The price keeps going up. LTL rates are almost certain to rise every time your contract renews. Smaller shippers have less leverage with large LTL carriers. That’s not the case with truckload carriers, who compete harder for loads – especially for dense Northeast shipping lanes. Legacy costs of big carriers inflate industry rates. The biggest LTL carriers have legacy costs like labor costs, pension programs, and overhead associated with running the network. So they raise their rates to ensure a decent profit and those rates become the standard for the industry. The smaller LTL carriers, who operate without these cost burdens, simply set their prices a little below the big guys and enjoy the hefty margins that result. Frustrating, right? You’ll have trouble comparing costs. LTL pricing is confusing, and when it’s hard to do an apples-to-apples comparison of rates across carriers, the buyer has less leverage. Each LTL carrier has its own way of calculating costs based on weight, dimensions, pallet count, origin and destination. So not only is it hard to compare, you may not even know in advance what your shipment will cost. It’s hard to reduce LTL shipping costs in this environment. The rate quoted is rarely the final rate. Yes, the dreaded accessorial charges, which kick in for any service beyond a basic delivery. Need unloading? An extra charge. Need delivery to an inner-city area. An extra charge. Some LTL companies even charge extra to use their tracking technology. The key to reduce freight costs is to think of your freight not as a small stream that flows directly to the ocean but as one of thousands of streams that join together to create a massive river of products going into that same ocean of the mass retailers and grocery chains that dominate the consumer goods supply chain. 3PLs like Kane Is Able are the matchmakers in this new collaborative distribution environment. They bring like shippers together, apply sophisticated technology to manage the process, coordinate with retailers, equitably parse out freight savings among shippers, and share shipment detail information across suppliers and retailers. 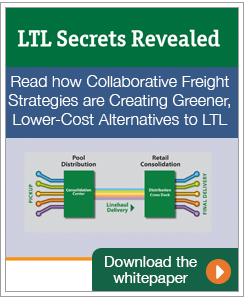 Learn more LTL secrets and how you can reduce LTL costs by checking out our paper: LTL Secrets Revealed.